When I was browsing in our local independent bookstore recently I happened to see a weighty edition of Louisa May Alcott's Little Women on the shelf in the children's classics section, and I grabbed it. It's on my list of parenting imperatives, of books I absolutely must read my daughters, and since Poppy is almost ten, I figure it's high time for Little Women. That night, since Poppy and I are still deep in Philip Pullman's His Dark Materials trilogy, I was the one to take a first look at Little Women. What an appealing edition it is, with an introduction by Jane Smiley and lovely deckle-edge pages with a satisfying substance to them, the weight of good paper. When I took a closer look, I saw that the cover is designed to look like an embroidery sampler, with the March family house at the top corner and the title picked out in satin stitch. The design is embossed into the paper, so that the stitching almost feels like real thread under the fingers. Then I opened the cover. There is a flap, an extra frill for a paperback, and when I pulled it open I discovered an astonishing surprise, an unlooked for bolt of joy. 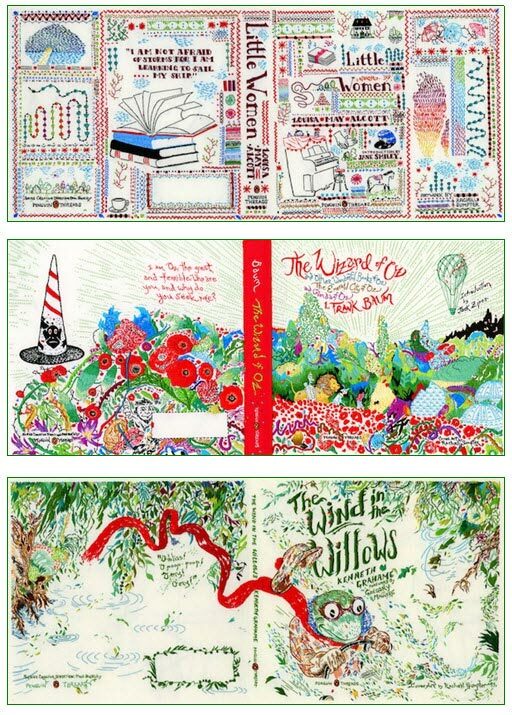 The back of the cover is printed with the reverse of the embroidery, a circuit board of multicolored threads - knots, tangles, mistakes and all. It felt as if the book was giving me an extra, secret gift. I turned it over and discovered the back cover was decorated in the same way, with a red zigzag border and the fluttering pages of an open book outlined in stem stitch on the outside, and on the reverse, the secret snarls of the back of the work. No matter that Little Women is a book I know well, have read before and will read again. This new cover adds meaning and fresh delight. This clever cover invites the reader to enter into the great and satisfying history of discussions about women's work and women's art and women's creativity (especially in the nineteenth century), about the link between the incredible intricacy of needlework and the comparable art of stitching a vast and sturdy assemblage of words into a novel. This cover playfully asks one to step behind the scenes of art, to see what happens on the back side, to imagine the labor and planning and unseen underpinnings that make a beautiful thing come together. Mothers used to teach their daughters that an accomplished embroiderer takes care to make the back of her work as neat and pretty as the front. It takes our modern eye to see that there is beauty in the mess, and the book cover has sent me into a fruitful meditation about the mess behind novel making, the effort it takes to make room in a woman's life (even now) to make a work of art. My edition of Little Women turns out to be part of a series called "Penguin Threads", reprints of classic books with embroidered covers. The first three in the series were embroided by Jillian Tamaki (shown directly below). The next three, including Little Women, are embroidered by Rachell Sumpter (see large image at very bottom). There is a tinge of wistfulness in my delight, though. The art-book link is still underexploited in modern book design, even as the publishing world begins to see the wisdom of lavishing more care on the printed book to distinguish it from the fleshless e-book. Big ticket books may get special design attention, but regular, mid-list books take pot luck (see The New York Times, "Selling Books by Their Gilded Covers", December 4, 2011.) It happens that I've heard a lot of complaining from author friends recently about the clumsiness of the cover design process. You can't judge a book by its cover, we always say - and yet see what fruit a good cover can bear, when it is in true harmony with the words inside the book (and not tied to some other mysterious rubric. Market forces? Focus groups?). Literary politics, or literary economics, weigh heavily on cover decisions. Meg Wolitzer wrote recently in the The New York Times Book Review of the difficulty women authors have in getting a cover that reads as "literary". She decries the conventional covers women novelists often get saddled with as enforcers of category. "These covers might as well have a hex sign slapped on them, along with the words: 'Stay away men!'" Book designers of the world, this is a problem you can solve. And no doubt there are many others. Of course the beautiful edition of Little Women I hold in my hand is engaged in a very different conversation from the one Meg Wolitzer is having about gendered literary categories (to be sure -- if the embroidery on the cover isn't feminine enough to give male readers a heads up, the title is a dead giveaway). But the elegance with which the Penguin Threads cover enters into dialog with the reader is proof that the physical incarnation of the book does matter. A well-made book in a meaningful package is more than the sum of its parts. The visual elements are not just embellishment, for a cover that can engage playfully with the words inside the book elevates and celebrates the achievement. A novel is a monument, not a printout." Just ask the nine year old. Last night over dinner my family was playing with a deck of conversation cards. One of us would draw a card, and each person would answer the question it posed. When it was Poppy's turn, she drew the question, "What is the greatest invention of all time?" While I was mentally mulling over my answer - I was thinking of going with "the toilet" or maybe "antibiotics" - Poppy blurted hers out in an instant. The novel. "This cover playfully asks one to step behind the scenes of art, to see what happens on the back side, to imagine the labor and planning and unseen underpinnings that make a beautiful thing come together." I love that you do a reading of the cover, beyond simply relishing its beauty and aptness. I bet the designer is mentally bowing down before you for getting it. I'm inspired to look at nineteenth-century book design more closely. What did they know that we have forgotten? This was a delight to read Jennifer! 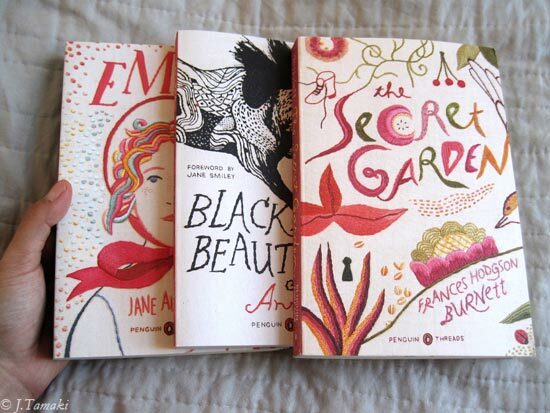 I'm a die-hard lover of classic novels and I do needlework, so especially appreciate the cover designs. Yay for the feel and smell of a real book! Your article brought back memories of evenings snuggled between my son and daughter who called me the peanut butter in their sandwich while I read them the books that always elicited late night pleas, "Please, Mom, just one more chapter." Our books were usually from the library or Scholastic editions bought for less than ten dollar from school book sales. Still, they were treasures. Oscar Wilde's The Happy Prince in an oversized paperback with exquisite illustrations, the sparser Wolves of Willoughby Chase by Joan Aiken which allowed them to embroider all the absent images with their own imaginations, and Claude the Dog, a perennial Christmas favorite that they still read to their own children today. That it's still available 20 years after our initial, purchase testifies to its value. Beautifully rendered publications are lovely, and I do admire them. But the gift of reading we pass on to our children is the gift of sparking imaginations and helping them to discover all the worlds contained between the covers of books in spite of the embellishment that adorns the cover. Wonderful article. I have a beautiful hardback of Little Women my mother gave me almost 40 years ago. Now I can add this, as well as the other threads books. Poppy is right about the novel!